1 To enable the making and attesting of declarations of office by Community Board members. 2 Elected members to Community Boards take up office on the day after the official declaration of the election results is publicly notified. However, they cannot make any decisions or otherwise act as a member until they have made an oral declaration and made a written declaration in the form set out in clause 14 of Schedule 7. 3 The oath for the Community Board members is taken at the inaugural meeting of the Community Board. However, following a By-Election this is undertaken at the first meeting after the official result is known. The Ward Councillor appointed to the Board will receive and witness the declaration of the Members. a) Receives the report titled “Making and Attesting of Members' Declarations” dated 9 February 2017.
b) Notes that the Councillor Duffy has received and witnessed the declaration of Community Board Members McKenzie and Wood. Minutes of a meeting of Edendale-Wyndham Community Board held in the Memorial Hall, Balaclava Street, Wyndham on Tuesday, 22 November 2016 at 7.30pm. Mayor Tong opened the meeting and advised that there were no apologies. He also welcomed all present. Mayor Tong called the Board Member’s Elect one by one to make their declaration to be a member of the Edendale-Wyndham Community Board. I, Denise Mary Fodie, Andrew Mark Roy, Melanie Jayne Shepherd and Pamela Joan Yorke declare that I will faithfully and impartially, and according to the best of my skill and judgement, execute and perform, in the best interests of the Edendale-Wyndham Community Board, the powers, authorities, and duties vested in or imposed upon me as a member of the Edendale-Wyndham Community Board by virtue of the Local Government Act 2002, the Local Government Official Information and Meetings Act 1987, or any other Act. Each of the members declarations were signed by them and counter signed by Mayor Tong. a) Receives the report titled “Making and Attesting of Members' Declarations” dated 15 November 2016.
b) Notes that the Mayor has received and witnessed the declaration of the Community Board Members. Mayor Tong called for nominations for the Chair of the Edendale-Wyndham Community Board. Melanie Shepherd nominated Pam Yorke and Andrew Roy seconded the nomination. There were no other nominations and the nomination of Pam Yorke for Chair of the Board was PUT and declared CARRIED. Mayor Tong then called for nominations for the Deputy Chair of the Edendale-Wyndham Community Board. Andrew Roy nominated Denise Fodie and Pam Yorke seconded the nomination. There were no other nominations and the nomination of Denise Fodie for Deputy Chair of the Board was PUT and declared CARRIED. a) Receives the report titled “Election of Chair and Deputy Chair” dated 4 November 2016.
b) Elects a Pam Yorke to be Chair of the Community Board for the 2016/2019 Triennium. c) Elects a Denise Fodie to be Deputy Chair of the Community Board for the 2016/2019 Triennium. At this point, Mayor Tong vacated the Chair and handed over to Pam Yorke to Chair meeting. Group Manager – Community and Futures was present for this item. Mr Capil advised on the content of the report and explained the various parts of the legislation that as a Member of the Edendale-Wyndham Community Board need to be aware of. 1. Receives the report titled “General Explanation from Chief Executive” dated 27 October 2016. Mr Capil advised that the Terms of Reference and Delegations that were before the Board for noting had been approved by Southland Council at its meeting on Wednesday 26 October 2016. The Board noted that there were some changes and that they appreciated the explanation from Mr Capil. a) Receives the report titled “Terms of Reference and Delegations 2016/2019” dated 12 November 2016.
b) Note the Terms of Reference and Delegations for Community Boards approved by Council at its meeting on Wednesday 26 October 2016. Committee Advisor – Fiona Dunlop was in attendance for this item. Miss Dunlop advised that the purpose of the report is to approve a schedule of meeting dates for 2017 so that meetings can be publicly notified in accordance with the requirements set by the Local Government Official Information and Meetings Act 1987. The Board noted that when the Southland District Council approved the Terms of Reference for the Community Boards at its meeting on 26 October 2016 the frequency of the meetings was also set to meet in February, April, June, August, October and December. a) Receives the report titled “Schedule of Meetings for 2017” dated 15 November 2016. · Tuesday 5 December 2017. Miss Dunlop advised that the purpose of the report was to advise the Community Board Standing Orders were adopted by Southland District Council at its meeting on Wednesday 26 October 2016. The Board noted the Standing Orders have been adopted by Council for use at all meetings of the Council, Committees, Subcommittees, Community Boards and Community Development Area Subcommittees. 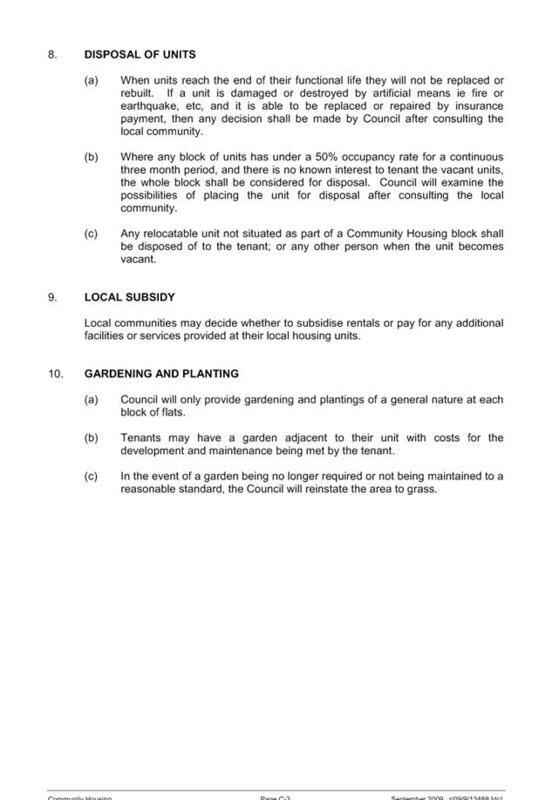 a) Receives the report titled “Standing Orders” dated 28 October 2016.
b) Note that Southland District Council at its meeting on Wednesday 26 October 2016 adopted Standing Orders for use at all Council, Committee, Subcommittee, Community Board and Community Development Area Subcommittee meetings of the Southland District Council and that it is required to operate in accordance with the Standing Orders so adopted. Mr Capil advised that the Code of Conduct was adopted by Council at its meeting on Wednesday 26 October 2016. The Board noted that the Code acts as a guide to ensure a standard of behaviour that is expected by all elected members (Councillors, Community Board and Community Development Area Subcommittees) when they are acting under Council delegations. 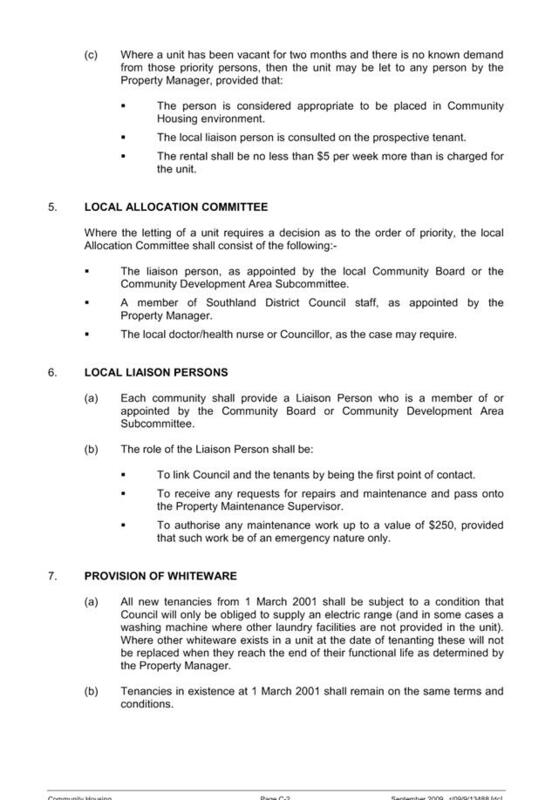 a) Receives the report titled “Elected Members Code of Conduct” dated 4 November 2016.
d) Notes the Elected Members Code of Conduct for Councillors and members of the Community Boards and Community Development Area Subcommittees of the Southland District Council which was adopted by Council at its meeting on 26 October 2016.
e) Adopts the Elected Members Code of Conduct when acting under its statutory powers as provided for in the Local Government Act 2002.
f) Notes that the Elected Members Code of Conduct must be complied with when the Board is acting under its delegations approved by Council at its meeting on 26 October 2016. Community Partnerships Leader - Michelle Stevenson was present for this item. 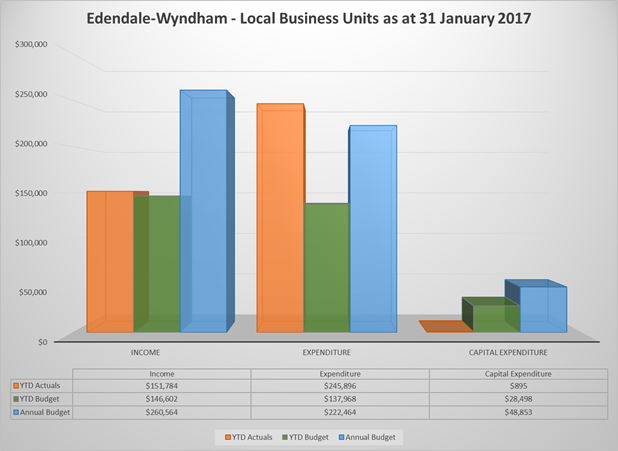 Miss Stevenson advised that the provides an overview of the forecasted services for the Edendale-Wyndham Community Board in 2017/2018 and includes any variations from what was forecasted in year three of the 10 Year Plan 2015-2025. The Board noted that the Southland District Council has streamlined its 2017/2018 Annual Plan process and as a result the Community Board is only required to review budgets for significant changes and that consideration should be given to funding any significant changes from reserves where appropriate. Miss Stevenson also advised that the draft budgets will be incorporated into the Council’s Draft Annual Plan. If consultation is required, this will occur in February 2017 and March 2017. Once the plan is finalised (and subject to any changes resulting from submissions), the budgets shown for 2017/2018 will be used to set rates for the year beginning 1 July 2017.
a) Receives the report titled “Annual Plan 2017/2018 Confirmation of Budgets” dated 14 November 2016.
d) Approves variations in the Edendale-Wyndham Community Board budgets from year three of the 10 Year Plan. e) Agree that the Budgets for the year commencing 1 July 2017 be adopted for inclusion in the Council’s Draft Annual Plan (subject to any amendments made at the meeting). f) Requests the levy of the following rates and charges (including GST) for the year commencing 1 July 2017 based on the approved budgets in (e) above. g) Requests the setting of the hall fees and charges (including GST) for the year commencing 1 July 2017, as attached in Appendix 3 of the officers report, for inclusion in the 2017/2018 Annual Plan. If excessive staining of the floor and commercial cleaning is required the cost of such will be charged to the hirer. h) Advises that there are no key highlights for the local area at this point. Identifies the key highlights for the local area (to be agreed at the meeting). The Board were advised that this report was notifying them of bylaws and policies which have been adopted by Southland District Council. a) Receives the report titled “Recently adopted Bylaws and Policies” dated 15 November 2016.
b) Notes that the Cemetery Management Policy, the Cemetery Bylaw 2016, the Ashton Flats Roading Bylaw, and the Gambling Venue and TAB Venue policies came into effect on 1 October 2016.
c) Notes that the Signs and Objects on Roads and Footpaths Bylaw 2016 will come into effect on 1 July 2017. The meeting concluded at 8.27pm. CONFIRMED AS A TRUE AND CORRECT RECORD AT A MEETING OF THE Edendale-Wyndham Community Board HELD ON TUESDAY 22 NOVEMBER 2016. 1 One of the key attributes of the SoRDS work to date has been the desire to ensure that a ‘whole of Southland’ or Southland Inc approach is adopted to the development of the region. This approach requires that public, private and volunteer sections of the Southland community come together to drive the development of the region as a whole. Unless a united approach is pursued then there is a very real risk that the changes needed to achieve the goals set through the SoRDS Strategy will not be achieved. 2 Work is being progressed via the Mayoral Forum to look at the structures that might be used to drive implementation of the Action Plan. The results of this work will be reported to each of the four Southland Councils and the other entities that need to be formally involved in the new structures over the next few months. There will also be a need for a public consultation process to be completed to enable the proposed model to be implemented. In the interim it is appropriate that Council move to formally endorse the Action Plan. The latter is the subject of separate order paper item. 3 The Fire and Emergency Management Bill, which provides for the establishment of Fire and Emergency Management NZ (FENZ) from 1 July 2017, continues to progress through the parliamentary legislative process with it being reported back from the Select Committee prior to the Christmas break. · The repeal, from 1 July 2017 of territorial authority specific bylaw making power for preventing the spread of fires. 5 The Health (Fluoridation of Drinking Water) Amendment Bill is currently before the Health Select Committee with submissions closing on 2 February. The intent of the Bill is to transfer responsibility for making decisions on fluoridation of water supplies from local authorities to District Health Boards (DHBs). 6 The Bill as currently drafted allows, but does not require, DHBs to determine whether they should direct local authorities to either fluoridate, or not, community drinking water supplies. 7 Under the Bill the cost of fluoridating water would be carried by the local authority concerned. Officers do not see a need for this Council to lodge a submission on the Bill. · local government does not enjoy a strong reputation with the public and businesses. On a comparable basis, New Zealand local government service satisfaction is rated similarly to countries such as the United Kingdom and Australia. 9 There is clearly work that the sector as a whole, as well as individual local authorities, can and need to do to enhance their performance and reputation. The findings from the survey will be used to inform the work that is being undertaken in this area. 10 Following the change in Prime Minister and subsequent Cabinet changes there has been a change in the Minister of Local Government. The Hon Anne Tolley now assumes responsibility for the portfolio taking over from the Hon Peseta Sam Lotu-Iiga. 11 With the change in Minister it can be expected that central government will continue to place a strong focus on sector reform and lifting the performance of local government in relation to the provision of core infrastructure. 12 In December, the refurbished Stewart Island Library and Area Office was opened. With increased hours for the community, the library now catalogued and a self-issue machine in place, a great space for the community has been created. Feedback from residents at the opening was positive with around 50 people coming through on the day. 13 The District Library was pleased to receive funding to help complete the Vince Boyle Collection to be housed at the Winton Library. An opening is being planned with members of the Boyle family invited to share in this historic resource they have donated. 14 Te Anau Library hours have changed with no late nights, a longer Saturday and being open on Monday mornings. Feedback has been positive and customers are enjoying the longer access on Saturdays. Hours across all libraries will be reviewed in 2017. 15 The Customer Support team are completing a review of the most common customer inquiries through Council and analysing how we could make these as simple and easy for customers through a variety of channels. Changing an address has come through as the number one Request for Service across the District. As a result, a project is in progress to look at how we can streamline this process for customers and staff. We are aiming to have a potential solution ready to trial internally in February 2017. 16 Customer Support have enlisted the Community Partnership Leaders to prepare a report on what and how our residents want to access Council Services across the District. This will involve market research across the District so we have a clear understanding of what our customers want, combined with our data on how customers choose to interact with us today. The report is anticipated to be completed by June 2017. Since we had been investigating the possibility of moving the Wyndham Library and Area Office to the Wyndham Memorial Hall, we will put this project on hold so as to ensure a consistent approach to the District as a whole. 17 The Environmental Health team is preparing for the introduction of Dog registration fee discounts in July this year. There will be a communications programme developed to raise awareness of the changes. The programme will include promotion on Council’s website, First Edition articles, and reviewing online registration. 18 Work has also been progressed with a research exercise looking at dog attacks in the District over the last few years to determine whether there are trends or other offence patterns that can be identified to help reduce future attacks. The findings will be reported to the Regulatory Committee in the near future. 19 The new Food Act 2014 came into effect from 1 March 2016. 20 Food businesses have to transition to the new Food Act 2014 according to a schedule set by the Ministry for Primary Industries. In this District the most significant group of businesses that have to transition in the first year (by 31 March 2017) are those with alcohol on-licenses. Most of these businesses have already transitioned. Officers will continue to encourage the small number remaining to transition by the required date. 21 Freedom Camping has continued to be a topical issue right across the country over the holiday period. In Southland District there has been a considerable amount of freedom camping activity in some parts of the District such as Lumsden, the South Catlins and Clifden Bridge. 22 At the time of writing there have been few significant problems or issues and a generally positive response to Council’s more proactive approach to liaison with campers in some of these areas. However, Council is also closely watching legislative developments in this area, with a strong push from some parts of the country for a more consistent approach to bylaws and/or a stronger approach to regulating freedom camping, particularly non self-contained vehicles and tents. · A requirement for three-yearly inspections of all swimming pools. Officers are currently assessing the impact of this change. · Allowing safety covers to be used as barriers for spa pools and hot tubs. · Introducing additional enforcement tools for territorial authorities, including notices to fix. 24 The amendments place more emphasis on the home owner taking responsibility for their pools. The swimming pool register will need to be updated to remove all pools under 5 m sq. The traditional spa pool which made up the bulk of the register is no longer covered by the legalisation. As yet there is no acceptable solution in place to assess barriers as being compliant but the Government has been consulting on options which might assist in this regard. · strike an appropriate balance between protecting people from harm in an earthquake, the cost of strengthening or removing earthquake-prone buildings and impacts on heritage. 26 The Southland District Council is the only District in the country to have all three earthquake zones in the one District. All of the earthquake prone buildings in the District have been identified and are recorded on a register, and are being identified on LIMs. Council will need to identify buildings of high seismic risk and ensure these are assessed by engineers within the specified time period. 27 Building consent numbers for December 2016 are down by 5.33%, the average residential cost and size is approximately the same from those of the corresponding 2015 period. Half way through the year and consent numbers are up slightly but the value is back 16.62%. The number of consents being lodged remains high, these are predominately from the Te Anau area. 28 The notice of requirement for the State Highway Bypass in Edendale is expected to be lodged with Council prior to the end of January. The New Zealand Transport Agency have requested that the application be publicly notified and have indicated that they will be requesting that a Commissioner is appointed to make the decision. 29 Mediation is being scheduled for the remaining appeals on the Proposed Southland District Plan. It is likely that mediation will occur in the first few months of 2017. There are five remaining appeals as four have already been resolved through previous mediation. It is likely that mediation will occur during February. 30 The Resource Management policy planners are in the process of preparing Variation 3 to the Proposed District Plan 2012. The list of amendments in the variation is still being prepared for approval by the Regulatory and Consents Committee. Once approved by the Committee the variation will be publicly notified and follow the normal Schedule 1 process. 31 Significant progress has been made on the preparation of the draft Annual Plan and associated consultation document. 32 Local estimates meetings have been completed and staff are preparing the consultation document in line with the feedback and direction provided by Councillors at the workshop in December 2016. Given that the draft plan is largely in line with what the 10 Year Plan forecasted for the 2017/18 year, the consultation document is more of an update on the 10 Year Plan story about how the Council is progressing with the plan. 33 The Consultation Document will be used to inform and update the community about the key changes from the LTP and highlight some of the projects/programmes scheduled for the 2017/18 year and advise readers how they can provide feedback to Council about the plan. The draft of the consultation document and supporting documents will be considered by Council in February before being released for public comment. 34 Significant work has been put into preparing for the Strategic Planning workshop to be held in early February. 35 The workshop provides an opportunity for Councillors to set their goals for the current triennium and the overall strategic framework within which the 2018 10 Year Plan will be developed. 36 Leadership Planning and goal setting workshops will be run throughout the District for Community Boards and CDA’s during April 2017. The workshops, which are to be run in groups of 3-5 Boards/CDA’s per workshop are intended to help each Board develop a Community Leadership Plan outlining the goals and strategic priorities that they have for their community in the current triennium and beyond. 37 It will be important that the Plans developed for each community reflect Council’s overall priorities for the District as a whole. In this way Council can ensure that Community Boards/CDAs are moving in a direction that is consistent with its goals for the district and that resources are prioritised between different areas in a way that reflects the resources available to Council as a whole. 38 The Leadership Planning and goal setting workshop for the Edendale/Wyndham Community Board is scheduled for Wednesday 26 April 5.30pm, directly preceding the next Edendale/Wyndham Community Board meeting. Food will be provided, and the workshop will include elected representatives from the Edendale/Wyndham Community Board, Tokanui Community Development Area Subcommittee, Gorge Road Community Development Area Subcommittee, and Woodlands Community Development Area Subcommittee. 39 Council have commissioned Venture Southland to undertake this project on its behalf. Council have requested face-to-face interviews be conducted with a representative sample of community organisations to help determine future needs and the level of service throughout the District. This project will be completed by Venture Southland in February 2017, and analysis and recommendations made by the Community Partnership Leader to the Councils Executive Leadership Team in May 2017. 40 Council have commissioned Venture Southland to undertake this project on its behalf. Council have requested research to help determine the current and future use of community facilities on the Island. This project will be completed by Venture Southland in March 2017, and analysis and recommendations made by the Community Partnership Leader to the Stewart Island Community Board in June 2017. 41 Council have tendered for registrations of interest to undertake a Community and Stakeholder Engagement process, and Business Operational Plan on Stewart Island wharfing infrastructure. Council currently own 5 of the 7 wharves on the Island, and have been offered opportunity to take over Golden Bay wharf, being divested by Southport NZ. Council identified the need to take a more strategic view of the current and future wharfing infrastructure on the Island, and the importance of the community and stakeholder needs, tourism to the Island and aquaculture, which may have local, district, regional and national implications. Tenders close at the end of February, and the Community and Stakeholder engagement will begin in March 2017. · Have a Governance Group (GG) appointed and a meeting in place for March. The GG to be made up of an Independent Chair, and one representative from each of the following - Council, DoC, Iwi, Business, and MBIE. Approaches, including a letter formally requesting a representative from these organisations, will be made shortly. · The Government’s $250,000 will be spent on scoping the project including any remuneration required for the GG, the contractor writing the investment proposal, the project manager if the investment proposal gets the go ahead. · The GG to be a ‘voluntarily’ formed group (i.e. not a formal committee of DoC or Council) that will make recommendations to DoC and Council. · Initial ToR to include a 9 month time frame for its existence with a decision point milestone on whether or how the project proceeds by September 2017. · Concurrently, with the Investment Proposal work the Project Management Team can be set up and an Expressions of Interest process run to identify potential project manager candidates. 43 Southland will receive $13.3 million to connect key communities with fibre under the Ultrafast Broadband programme (UFB2). Winton, Te Anau, Riverton West, Bluff and Otatara have been announced as locations which will receive fibre between July 2017 and December 2024. No timetable for each location has yet been published. 44 Southland is identified as having almost complete wireless coverage, however feedback from communities reveals this is not the case. Results of internet speed tests and the Southland Internet and Mobile Surveys (over 1000 responses were received to these surveys in 2015 and 2016) have been submitted to MBIE and Crown Fibre. Assessment of mobile signal coverage on the Southland road network is also being undertaken. 45 The SDC Holiday Programme was recently held again in rural Southland communities, with a 23% growth in the number of participants overall. The programme was run in Wyndham and there were 20 participants. Feedback has once again been positive. 46 Southland tourism has been at its busiest recently and will continue to be so for the next couple of months. The Wyndham and Edendale areas will possibly continue to see more ‘free and independent travellers’ who may have come from the Southern Scenic Route and the Catlins. There continues to be significant growth in these two areas/products. 47 Edendale Vintage Machinery Club – event support and assistance continues to be provided as required, particularly in regards to Crank Up Day. Other support and strategic planning has also been provided. 48 Wyndham Rugby Club and Menzies Rugby Club – Venture Southland staff have been working alongside representatives from the Wyndham Rugby Club and the Menzies Rugby Club with funding advice and assistance for the redevelopment of the Raglan Street Reserve. 49 Wyndham and Districts Historical Society – planning assistance and advice is being provided regarding the investigation of future options for the Wyndham Museum facility, Society and collections. The Society are investigating possible options for the relocation of the Museum due to the seismic issues with the current building they are located in. 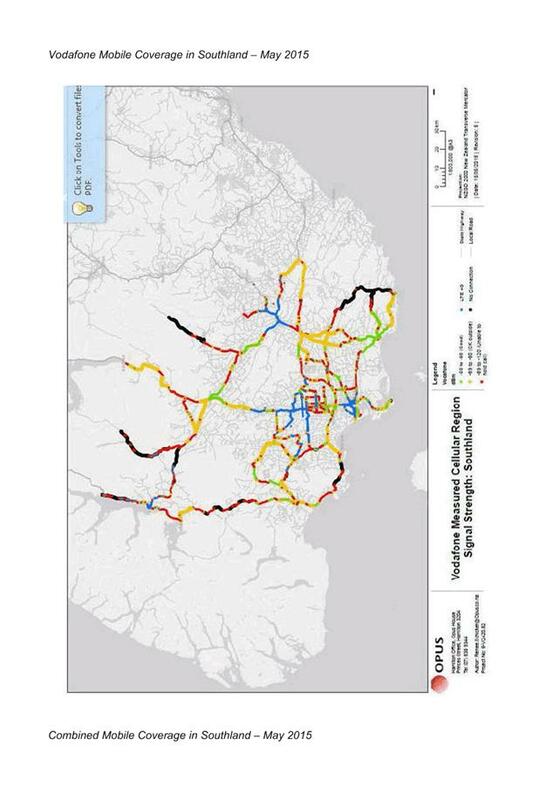 50 Tender documents for the Alternative Coastal Route Improvement Project in the Catlins area and the three Maintenance Alliance contracts were finalised and released in December 2016. 51 The release of these tender documents represent an important milestone in what are all sizeable projects/contracts for Council. As a result there has been significant work involved in reaching this stage of the process. The four tenders close in mid-February and will be subjected to a tender evaluation process prior to recommendations being made to Council. 52 Having a close working relationship with the Planning and Investment division of the NZ Transport Agency (NZTA) is important for both organisations given the size of investment that they make in Southland transport networks. 53 In recent months good progress has been made in developing a strong working relationship with our NZTA liaison person. Unfortunately, the relationship that we are developing could be affected by a reorganisation which we understand may be occurring in the near future. This situation creates a risk to the Council that we will not receive the most effective or appropriate level of support. 54 In December 2016, Council reached a settlement agreement with Fiordland Sewage Options (FSO) in relation to their appeal against the resource consents granted for the wastewater disposal system proposed for the Kepler block. 55 The agreement provides for Council agreeing to investigate the potential to develop a disposal system at an alternative site known as the Smith Block, located in Sinclair Road Te Anau, in return for FSO withdrawing the appeal. The agreement has a series of steps in it with Council retaining the right to exercise the Kepler consent should the investigations indicate that the Smith block is not viable at any stage. 56 Work is being progressed to ‘map out’ the tasks that need to be completed and the timelines for them. An outline of the project plan will be bought through to Council and the Te Anau Wastewater Project Committee once finalised. There will also be a need for regular consultation with key stakeholders and affected parties. A Consultation Plan is currently being developed. Making progress on the key tasks will be a priority for the start of 2017. 57 LIM’s have been received for the former office and library and the former Edendale hall. As both of these have been declared surplus by Council arrangements will be put in place in the next couple of weeks with a real estate agent to get the properties on the marked for disposal. 58 Dialogue is ongoing with the Wyndham museum committee regarding their continued use of the existing building. Given its low seismic rating what has been relayed to the committee, is they can continue to operate as is until 31 December 2017 after which public access cannot continue and is to stop. The building can for 5 years after that date continue to be used for storage only. One vacated the demolition/disposal of the building and property will be subject to separate reports to the board and Council. 61 There is a capital expenditure project forecast for this financial year which has not yet commenced. This is a project to upgrade footpaths. The priority areas for the work have been identified and are currently being priced with a contractor. The estimated completion date of the project is June 2017.
a) Receives the report titled “Council Report” dated 20 February 2017. 1 Venture Southland is leading work for the region to advocate for improved internet and mobile services for Southland’s rural communities. 3 Mar 2015 Region wide consultation with over 1000 responses from individuals and businesses. 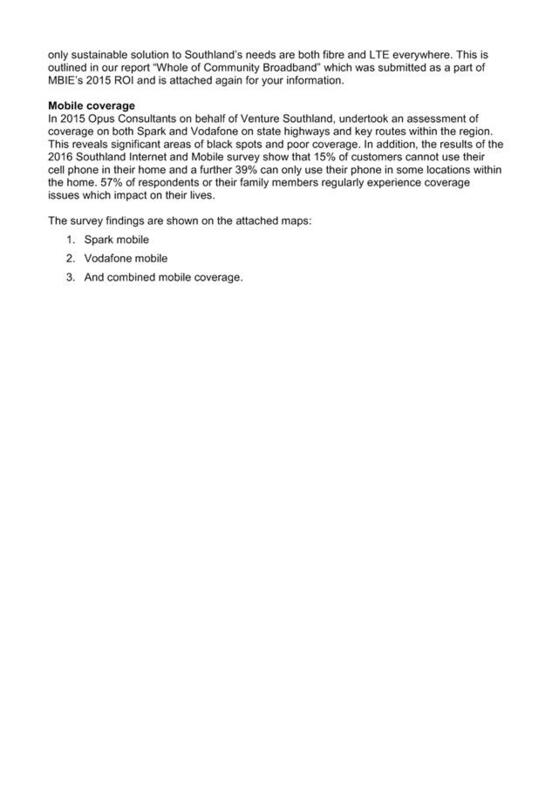 4 May 2015 Technical review of mobile phone service on state highways and key routes through the region. 6 Secondary submission for a whole of community solution advocating for fibre (Ultrafast broadband) and LTE (4G Mobile services) for everyone in Southland. 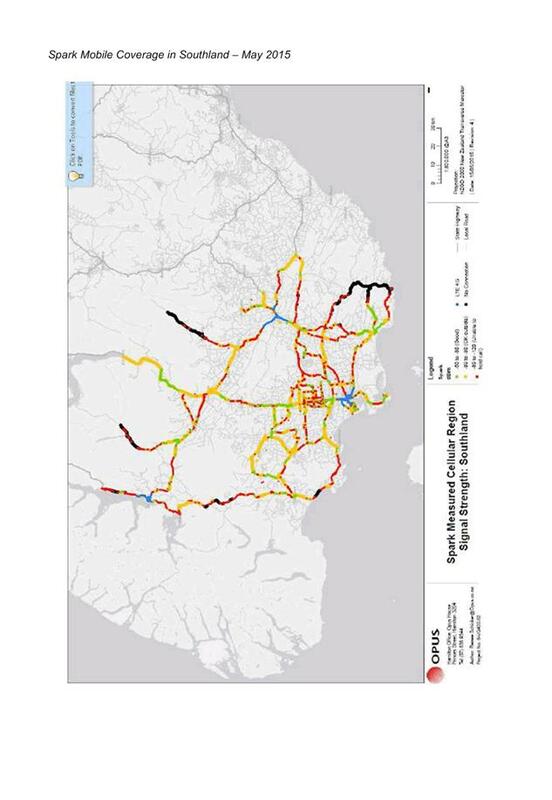 7 Nov 2015 MBIE announced longlist for towns to receive fibre (UFB2) and delays to the rural broadband (RBI2) and mobile blackspot programmes (MBF). 8 Aug 2016 New contracts were announced for existing rural broadband customers (RBI1). This improved minimum contractual standards for 4G customers to 30Mbps. (Note: RBI1 services are provided by Vodafone on a mix of 3G and 4G towers transmitting wireless internet). 9 Oct 2016 Crown Fibre Holdings announced as lead agency for the remainder of the fibre (UFB2), rural broadband (RBI2) and Mobile Blackspot Fund (MBF) procurement process. 10 Nov 2016 Update community consultation undertaken with over 200 responses from around Southland and internet speed tests undertaken. 11 Dec 2016 Rural Broadband (RBI2) Submission made to Crown Fibre Holdings made by Venture Southland. 12 Jan 2017 Government announcement made that Winton, Te Anau, Riverton West, Bluff and Otatara will receive fibre. 13 Apr 2017 Telecommunication service provider Rural Broadband (RBI2) solutions proposals due to Crown Fibre Holdings. 14 The Government has set aspirational targets that by 2025, 99% of New Zealanders will have access to broadband of at least 50 Mbps and 100% of New Zealanders will have access to broadband of at least 10 Mbps. 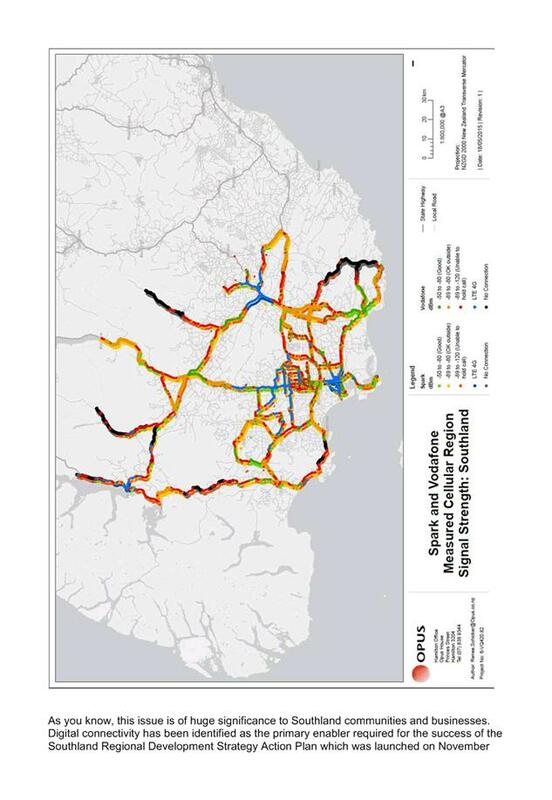 However, research undertaken by Venture Southland shows that many Southlanders are not yet receiving anywhere near these standards and that the proposed improvements are unlikely to achieve the goals intended. 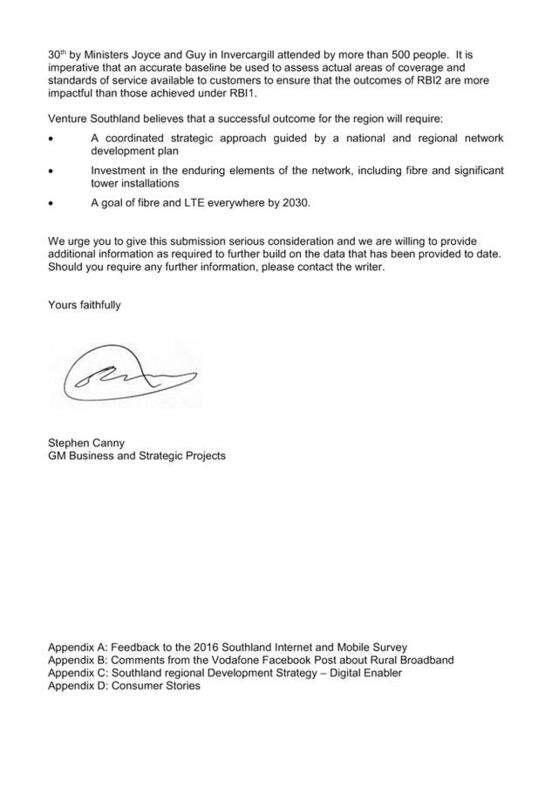 15 Significant research has been undertaken and submissions made as part of the process being led by Crown Fibre Holdings Ltd, on behalf of the Government, to implement the second round of the Rural Broadband programme (RBI2), the Ultrafast Broadband programme (UFB2) and the Mobile Blackspot Fund (MBF), which is a new fund designed to improve mobile coverage on key tourism routes. 16 Venture Southland’s work was instrumental in achieving some early success outlined in the announcement made on 26 January 2017 that Southland will receive $13.3 million to connect key communities with fibre under the UFB2 programme. Accordingly, Winton, Te Anau, Riverton West, Bluff and Otatara have just been announced as locations which will receive fibre between July 2017 and December 2024. A timetable for each location is expected to be published in 90 days. Priority is being given to completion of UFB1 (within Southland that includes Gore and Mataura, which are not scheduled for completion until 2019). 17 Venture Southland is continuing to work closely with Crown Fibre Holdings and with local Internet operators to seek improved coverage for rural areas under RBI2. The primary change from RBI1 to RBI2 is that telecommunication providers can propose solutions based on any technology type, not just wireless broadband. 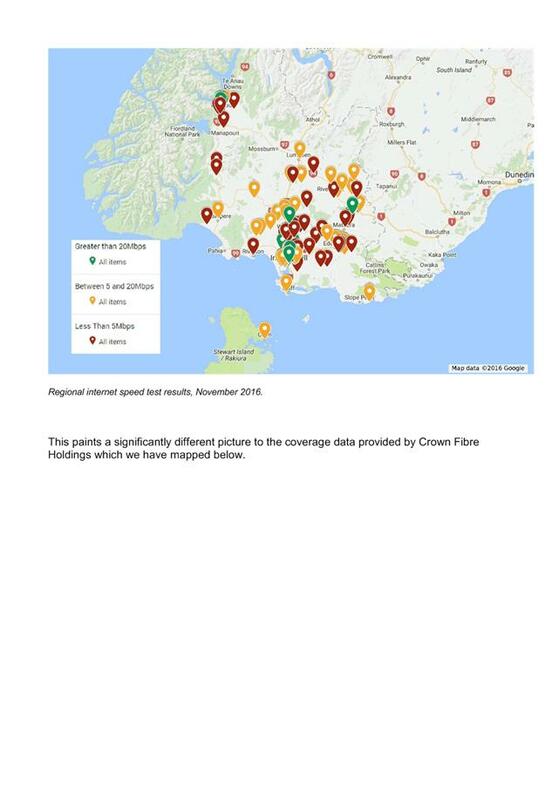 The rural broadband wireless coverage maps which have been published as a guide for RBI2 submissions show Southland as having almost complete coverage, yet feedback from communities reveals this is not the case. 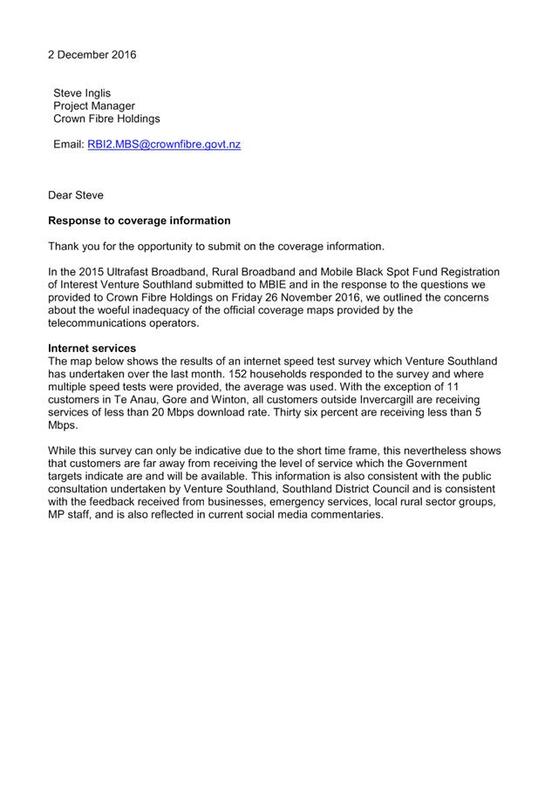 Venture Southland has submitted the results of internet speed tests and the Southland Internet and Mobile Surveys (over 1000 responses were received to these surveys in 2015 and 2016) to MBIE and Crown Fibre Holdings. Crown Fibre Holdings is currently working to assess areas currently receiving less than 20 Mbps (Category 2 users). 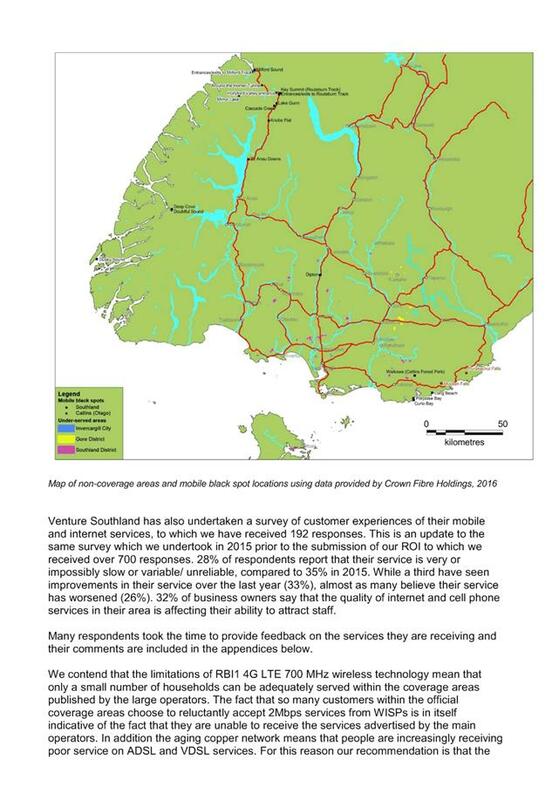 18 Assessment of mobile signal coverage on the Southland road network is also being undertaken by Venture Southland. A copy of the submission made to Crown Fibre Holdings is attached for those interested in the detail. What does this mean for Edendale-Wyndham and environs? 19 Fibre (UFB2): Edendale-Wyndham did not meet the population criteria to receive fibre under the UFB2 programme and the Government has no plans to install fibre for Edendale-Wyndham townships. 21 There are 15 areas to the south east of Wyndham on the Crown Fibre Holdings list of areas not yet covered by RBI1 (receiving less than 5 Mbps – known as Category 1 end-users). However, it should be noted that Venture Southland is disputing the accuracy of this map as it does not accord with feedback from the region, which suggests that problems with coverage are much broader. 59 people responded to the 2016 Southland Internet and Mobile Survey from Gore City and Eastern Southland – 32% had significant problems with their internet and 33% said it was slow but effective. Thirteen people in the Edendale-Wyndham area took part in the 2016 Internet Speed Test, nine of whom had speeds between 5 Mbps (the existing minimum 3G RBI contractual standard) and 20 Mbps (the coverage required Category 2 end users), The other four had speeds of less than 5 Mbps which puts them as Category 1 end-users. 22 Existing minimum 4G RBI contractual standards introduced in August 2016 require 30 Mbps minimum for 4G RBI customers. There are two towers in the Edendale-Wyndham area which are 4G RBI and so theoretically all consumers being served by these towers should be receiving 30 Mbps minimum speeds. Individuals or businesses having problems with their service should contact Venture Southland (see below). 23 Mobile Coverage (MBF): No locations near Wallacetown are on the Mobile Blackspot Fund longlist. This fund is intended primarily to improve connectivity on key tourist routes. 24 The submission made to Crown Fibre Holdings by Venture Southland is attached for those interested in the detail. 25 Up to date feedback from the community is essential to enable Venture Southland continue advocacy on behalf of the region. Navarre Campbell, Digital Enablement Coordinator, is available to discuss communities and individuals concerns with their internet and mobile services. He can be reached on 03 211 1400 and navarre@venturesouthland.co.nz. Venture Southland is available to come and speak with the Edendale-Wyndham Community Board if this is of interest. a) Receives the report titled “Southland Internet and Mobile Services - Update for Edendale-Wyndham Community Board” dated 20 February 2017. 1 The purpose of the report is to consider a recommendation that grazing of part of the Wyndham cemetery be allocated to John and Katherine McLaren. 2 The Licence issued to John and Katherine McLaren for grazing stock on part of the Wyndham Cemetery expired on 31 January 2017. 3 It is proposed that a new licence be issued to Mr and Mrs McLaren for a term of five years from 1 February 2017.
a) Receives the report titled “Grazing Part Wyndham Cemetery Land” dated 21 February 2017.
d) Resolves that a licence under the Reserves Act 1977 over part of the Wyndham cemetery being part of Section 26, Block I, Wyndham Survey District be issued to John Robert McLaren and Katherine Jane McLaren for a term of five years from 1 February 2017 at an annual rental of $100 plus GST. e) Resolves that the draft licence agreement as appended be approved. NZ Gazette 1981, page 2255. The land is described as Section 26, Block I, Wyndham Survey District and contains 4.0924 hectares. 5 The McLaren family has grazed sheep, and occasionally cattle, on part of the land for many years. 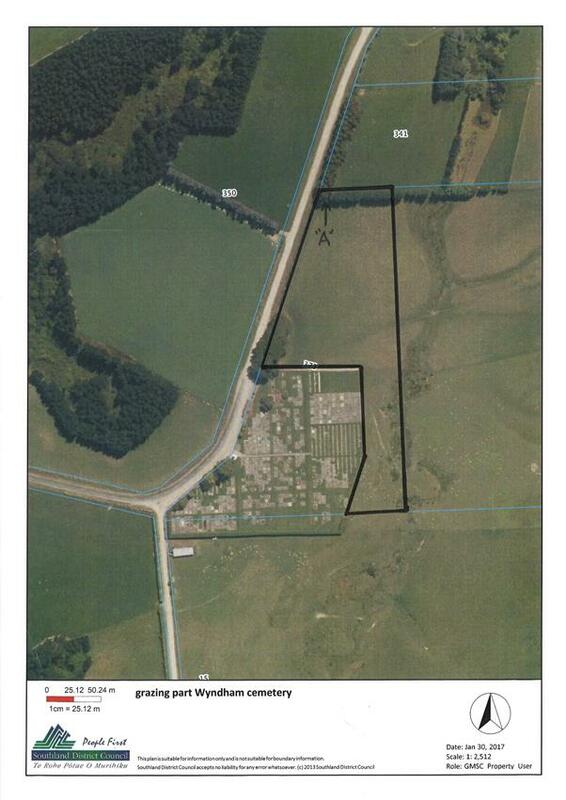 The area grazed, approximately 2.04 hectares, is outlined in bold black lines on the plan attached to the licence (included as an attachment to the report). Term: Five years from 1 February 2017. Annual rental: $100 plus GST. Clause 1: Primarily for grazing of sheep however grazing of cattle permitted from time to time. Clause 6(b): Licensee to ensure that no damage occurs to the lone gravesite marked ‘A’ on the plan attached. 7 The $100 annual rental suggested is the amount that Mr and Mrs McLaren are currently paying. Former community engineer, Kushla Tapper, has indicated that the McLaren’s keep the land tidy and maintain it to a high standard and believes the rental to be appropriate. 8 Mr and Mrs McLaren have indicated via telephone that they wish to enter into a new licence. 9 Mr and Mrs McLaren own and farm the land adjoining the cemetery. 10 The licence agreement sets the terms under which the licence is issued and the obligations of the parties. 11 The views of the Board are deemed to represent those of the community. 12 There are no direct costs to the Board in considering this matter. 16 To decline to issue a licence to Mr and Mrs McLaren. · As adjoining owners the licensee will be in a position to keep an eye on the land. · Maintenance of the land. · The Board may end up being liable for the costs of maintenance. · Th Board may have to arrange for grazing by someone else. 17 Not considered to be significant. 18 Option 1 is recommended. 19 Licence documentation will be sent for signing. AN AGREEMENT made this day of 2017. 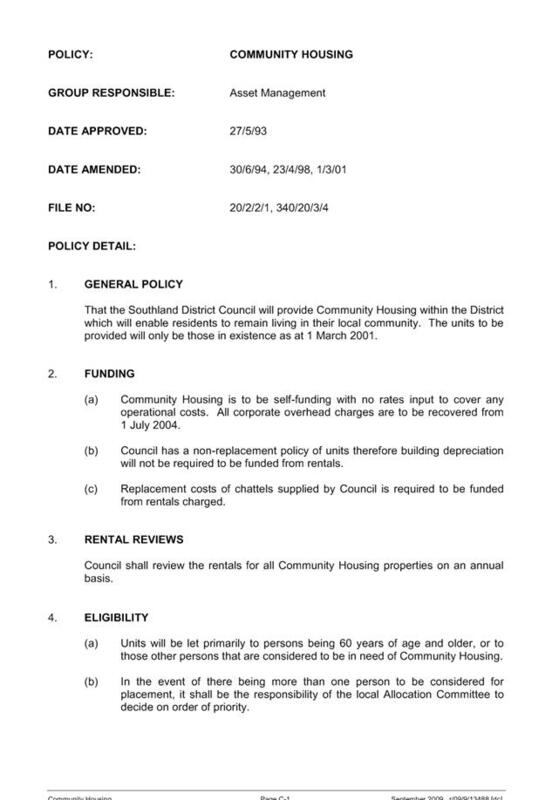 WHEREAS the Southland District Council, a body corporate under the Local Government Act 2002 (hereinafter together with its successors and assigns called "the Licensor") has under the provisions of Section 74 of the Reserves Act 1977 authorised a Licence to be issued to John Robert McLaren and Katherine Jane McLaren both of Wyndham (hereinafter referred to as the "Licensees") over all that area containing 2.04 hectares more or less situated in the Land District of Southland and being part of Section 26, Block I, Wyndham Survey District, as the same is more particularly delineated on the plan attached hereto and thereon outlined in bold black lines. NOW THEREFORE the Licensor doth hereby licence and authorise the Licensees to occupy the land described herein for a term of five years commencing on the 1st day of February 2017. 1. The Licensees shall only use the land primarily for the grazing of sheep however they may from time to time graze cattle. 2. The Licensees shall not at any time during the said term assign, sublet, mortgage or otherwise dispose of his interest or any part thereof in the lease without the consent of the Licensor. 3. The Licensees will use and manage the said land in a good and husbandlike manner and not impoverish or waste the soil thereof. 4. The Licensees will to the satisfaction of the Licensor control the said land from gorse, broom and all noxious plants, and keep clear rabbits and other vermin. 5. The Licensees will not break up or crop any part of the said land, nor cut down any trees or brush, without the prior consent of the Licensor. 6. (a) The Licensees shall not damage or destroy any natural scenic historic cultural archaeological biological geological or other scientific feature or indigenous flora and fauna on the said land. (b) The Licensees shall ensure that the gravesite shown as Area A on the plan attached hereto is not damaged or destroyed. 7. The Licensees will not erect any buildings on the said land without the prior consent of the Licensor. 8. The Licensees will at all times during the term keep all buildings, fences, gates, enclosures and other structures and improvements now erected or made or which may hereinafter be erected or made on the land or on the boundaries thereof in good repair order and condition and yield up the same at the expiration or sooner determination of the said term. 9. (a) The Licensees shall erect and maintain all boundary fences and shall assume all the obligations that may be imposed on the Licensor by operation of law in regard to fencing on the land or along the boundaries. (b) That should the boundary fence between the cemetery and the area to be grazed require to be relocated, then such relocation is to be undertaken by the Licensees at their own expense and to their satisfaction. 10. The Licensees will throughout the term of his Licence to the satisfaction of the Licensor cut and trim all live fences and hedges upon the land and keep clean and clear from weeds and keep open all creeks, drains, ditches and watercourses which may be constructed after the commencement of the term of this Licence. Provided that if there is any breach of this covenant the Licensor may do any work necessary to remedy the breach and charge the Licensees the reasonable cost of the work. 11. The Licensees are liable to pay rates and any other charges which may be lawfully imposed on them as occupier of the said land. 12. That in the event of the Licensees wishing to surrender this Licence during the currency of the term such surrender may be accepted by the Licensor on such condition as the Licensor may deem appropriate, including a condition that the Licensees shall be required to bear and pay any local body rates payable under the lease from the date of acceptance of the surrender until the date at which the Licence would have expired had surrender not been accepted or the end of the rating period, whichever is the sooner. 13. The Licensees shall permit any person or persons appointed by the Licensor to inspect the land and all building erections and installations and the Licensees will immediately comply with all directions from the Licensor in regard to any matter whatsoever. 14. All or any of the powers and functions exercisable by the Licensor under these presents may from time to time be exercised by the Chief Executive of the Licensor or by any person authorised in that behalf by the Chief Executive. 15. In the event of a breach of any of the conditions of this licence, this licence may be determined at any time by the Licensor in respect of the whole or any portion of the land upon the Licensor giving to the Licensees one calendar month's notice in writing of his intention so to determine this lease. 16. Upon the expiration or sooner determination of this Lease either as to the whole or any part of the said land the Licensees shall not be entitled to compensation for any improvements effected by him but he may within such time as the Licensor shall determine remove all buildings, enclosures, fencing, or other improvements effected or purchased by him and should this lease be determined as to part of the said land then the Licensor shall make such adjustment to the rent payable as he shall in his discretion deem fit and proper. 17. Nothing contained or implied in this Licence shall be deemed to confer on the Licensees the right to acquire the fee simple of the said land. 18. The Licensees will not do or permit or suffer anything to be done in or upon the land and any buildings thereon or any part or parts thereof which may be or become a nuisance or annoyance or cause damage or inconvenience to the Licensor or to the owners or occupiers of any neighbouring land or premises. 19. The licensee if grazing any stock near any water body as defined by the Resource Management Act 1991 shall fully comply with the relevant provisions of that Act, the District Plan and any regional plan. IN WITNESS WHEREOF THESE PRESENTS HAVE BEEN EXECUTED BY THE PARTIES HERETO THE DAY AND YEAR FIRST ABOVE WRITTEN. 1 The purpose of the report is to appoint Edendale-Wyndham Community Board members as liaison persons to numerous entities in the Edendale and Wyndham communities. 2 One of the main liaison positions that needs to be appointed is the Community Housing liaison person. Two appointments need to be made, one being for the Edendale area and the other for the Wyndham area. 3 A copy of the Community Housing Policy is attached to the report. Section 6 of this policy contains a description of the role that the liaison person is expected to undertake on behalf of the Board. 4 There are also numerous other entities/organisations that the Community Board have previously appointed members to as a liaison/point of contact. These are as follows - Resource Management, Fonterra Edendale Factory, Ensign/Edendale Informer/Wyndham Messenger, Edendale Community Pool, Edendale Wyndham Community Health Trust, RSA Scholarship, Memorial Hall Wyndham/Community Centre and John Beange Trust. 5 The Board may choose to appoint members to all of the positions or not. At each Community Board meeting there is an opportunity for Board members to update the Board on happenings with the entity that they have been tasked with as the liaison person. a) Receives the report titled “Community Liaison Persons” dated 19 January 2017.
b) Agrees to appoint a Board member as the Community Housing liaison person for Edendale for the 2016/2019 triennium. c) Agrees to appoint a Board member as the Community Housing liaison person for Wyndham for the 2016/2019 triennium.